Just before new year's day, a good friend and spiritual director Fr Jim Czerkawski passed away unexpectedly. I wasn't able to make it to the services in Boston, especially because the airfares were about $2000 for a short-term, quick turnaround trip. So, what I decided to do was use a more reasonable amount of money that I might have spent on airfare to use in ministry as an act in Fr Jim's memory. I decided to use about $500 for several things: bibles to sell at an 80% discount to the people of Chontal; Food for the Bazurto family in Puerto Quito, who were my next door neighbors there in the month of January; eyeglasses for the two of the Bazurto children; and a dresser for the Bazurto family. The reasons were because, well, these were real needs, but also because they each reflected something about how Fr Jim was with me and the rest of the people he ministered to at St Anthony Shrine. First, I got to know Fr Jim through our men's faith sharing group at St Anthony Shrine, where we read and meditate on the Scripture passages for each week. The bible was always central to his spirituality, as it is to mine. In addition, Fr Jim was always inviting me and other out to eat or up (into the Shrine) to eat. Food was a central part of his forming charity, and not to mention providing food for the homeless who might be out on the street near the Shrine. He had had persistent eye problems over the past year or more that affected his vision, and probably most important of all to me in a lot of ways, he helped me the most when I was preparing to go to Ecuador in 2013 for the year. He gave me a bit of money, but he also donated a suitcase for luggage that has proven invaluable and that I still use. So, when I saw the opportunity to contribute to the lives of the Bazurtos and the people of Chontal in these ways, I saw also something of the memory of Fr Jim. But in addition to this, the men's faith group at St Anthony's is preparing to share in the donation for food for the Bazurto family. In the next few weeks, we hope to have a dedicated donation for food to give to the Franciscan Sisters of St Joseph, who work closely with the Bazurtos. Fr Jim was always big on the Jewish word Shalom, which means more than just the popular understanding of peace, but also fulfillment. He had always ended his homilies with the phrase, May God give you His peace. Now, in his memory, my prayer is that God gives him His peace - His Shalom. When I arrived in Chontal, I got together with the parish priest, Padre Marcelo Chuma, and asked him about possibilities for pastoral ministry in the church. He said, "The pueblo is yours, Jerome, do whatever you want!" So that’s what I did. The first idea was to open the church more regularly. There are three Masses every week (that's a lot for a small rural community! ), but on the other days and times, the church is locked up. 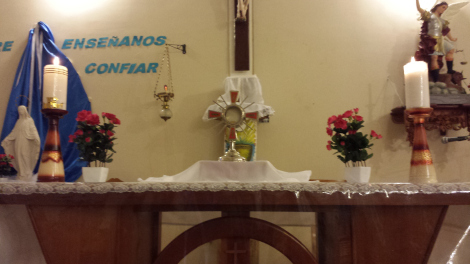 So, I decided to open the church for about an hour and half for three more days of the week, in the early evenings. This is a new concept and challenge, and it begins to upset the apple cart somewhat, because, well, that needs a little explaining. Like most parishes and towns, there are the more regular church goers and then there's many other people living life without church activities except when their kids are ready for sacraments. Now, I don’t put the blame on them so much. Where I do think is the bigger problem is with the "regular" church people. "You shut the kingdom of heaven against men; for you neither enter yourselves, nor allow those who would enter to go in." And so, it seems that the biggest reason that people do not come to church is, in effect, because they have been nudged and blocked out. A few regular churchgoers have a certain control over all church activities. To simply open the church and leave it freely available for all to come and go as they please, that means that the regulars have to let go. And the apple cart turns over. It became even more in conflict with the most active of the lay leaders. When I arrived, she had recently arranged to have the internet antennas for her restaurant (which is across the way from the church) actually installed on the church steeple, without discussing the matter with anyone beforehand! And they were running off the church's power to boot! Though I love the woman, she continues to be very harsh with the children in catechesis, critical on others' moral issues and strictness with ceremonial details, and frequently crossing lines of healthy role boundaries, while at the same time skipping many of her own church responsibilities for the sake of her business and living a life with her boyfriend. Headstrong in being demanding with others and yet not fulfilling her own basic obligations in the church, she has become a source of discontent among the people. The priest has been slow to take action in part because he's very busy and in part because he has his own issues, and the other few lay leaders don't participate so much to be interested in taking actions. They have a comfort level because the apple cart hadn't tipped yet to affect them, as they can still feel like they're in possession of the church. But the ultimate result is that many people in the village have been hurt or offended by the whole situation. It's a very significant problem, probably the core problem in the pueblo (and a recurring problem throughout Latin America), because it affects the everyone's relationship with God and each other. Such is how hypocrisy divides and pushes people out. The open chapel is an experiential sign of God's open heart, a heart that leaves us free to come and go to it whenever we feel called in our own heart. It's a call that works by attraction, not obligation or any external authority. This type of freedom is a new thing in the poor areas of Latin America. Most of the time, the church was empty. But it reminded me of a story from my month in Puerto Quito. My neighbors in Puerto Quito, the Bazurtos, had a dog named Blacky. Just when I arrived, she had had a few pups. After a few days, the pups were nowhere to be seen. Most likely, the family had killed the pups, because they couldn't afford to feed or care for them, and the pups could also cause damage to the chickens. Such is the abusive life of a dog in the poor areas of Ecuador, and I bet in most developing places in the world. In the majority of cases, dogs are scrawny and starving, are viewed as protection for the property rather than as pets. They are abused. And abused dogs have a hard time accepting human affection. So it was with Blacky. If I called Blacky, she would cower, because her experience of a man speaking to her was the precursor to some type of abuse. She avoided me. So, what I started to do was offer her food. I would open my door and squat down to her level, and then I would hold out a piece of bread to her. Then, you could see a huge conflict inside, between the instinct of a starving dog for food, and its instinct to avoid the pain of abuse. She would stay motionless and conflicted for a minute or two. And then I would slowly withdraw the food back into the house. At that point, she would take a step forward and lick her chops, because the food was disappearing. Then, I would slowly bring the bread back out to her and she would slowly reach out and take it into mouth, after which she would devour it. But I had to move slow, and I couldn't speak - no sudden movements or noises, just calm and quiet and slow. After the first time, I was excited - the dog now trusts me, I thought. The next day I call, and she runs away. I offer the food, and it's like the whole exchange from the day before never happened. We were starting all over again in learning the game of trust. I realized that this dog was so hurt from abuse, that it was going to take a long time to finally get trust. Well, I can tell you, that bit by bit, Blacky was able to grow in trusting me, until after a month, on my very last day in Puerto Quito, for the very first time she let me reach out and pet her. A second ministry that I began in Lent was what I called Paseos Biblicos, or Bible Outings. A paseo is a recreational outing, like going on a hike or going to the beach. The idea is that the Bible is like a river (or a beach or a mountain): it is a mystery to be experienced, and you really only know it by experiencing it, gradually, step by step. But you need a guide to get you started. So, I offered a menu of different themes that I could present on, that people could pick from, and we would have a sort of "outing" to parts of the bible, like you might go to the river to swim or get water or wash clothes, etc. 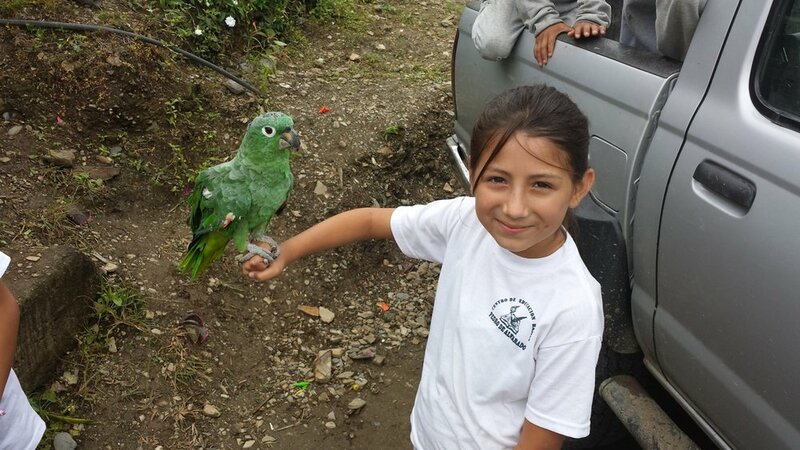 The pedagogy here in rural Ecuador is on the harsh and demanding side, with little room for mystery. Everything has to fit into the box with firm edges. It's confining. And people looking for God really want something else. So, I started using the technology of projector and powerpoint to present a series of 50-minute long themes from the bible with history and pictures and personal stories, etc. We explore the bible like you'd have a guide bring you to the river. We did 5 different themes, one each Sunday of Lent, and we'll pick up again on this weekend to decide what's next. We get about 6 to eight people each time. So we'll see where it goes …. And there's a request to record the presentations for others to use as well, so we'll see if I can do that, too. In the time before Holy Week, there was a baptism and there were two groups of kids who received their first Communion and Confirmation. I had helped in some of the kids' preparation along the way, and preparation of the families for baptism. I received the first sacraments of initiation as a kid, and I have a few fond memories. But from those experiences, I never had a fire in my heart that I cherished to grow. I never experienced finding the treasure of treasures, though I did have a special love for Jesus in my heart. And although you can never know exactly what is in everyone's heart, you can certainly sense the culture of a people, a place, or an event, and I can say that the feel of the preparations and liturgies certainly didn't convey that fire, either. It wasn't until as an adult, in experiencing Jesus himself, his coming for me, as a real experience, that I felt I had found the treasure of treasures, one that I would be willing to leave everything else for. That treasure is also in my own heart, and it's that fire that leads me. But that fire could only be permanently lit when I left everyone and everything behind for its sake, for the sake of the relationship with Jesus. Which is to say, if Jesus is not your treasure of treasures, you're not yet a disciple of his. You're really not a Christian yet. And yet, there are people who would not call themselves Catholic or Christian who have left much behind to follow a dream, an inspiration, and may well be following the trail of Jesus. But if there is no discovery of a treasure, we can't accept the leaving behind part. Who would? You only leave the good things you've got if you've found something that fulfills and completes them. To make sacrifices without a view to getting back - in a totally inclusive and fuller way - what you've left, well that would be self-destructive. That's not God. So, it's good to not talk about the death-to-self if there is no treasure to be sought, if there is no fuller "self" to be found. And that's basically why the approach to the sacraments of initiation in all of the parishes I've ever encountered - in the US or Ecuador - never really talks much about leaving people or things behind: because it doesn't present the Treasure. There really isn't presented anyone so good for whom it's worth leaving behind even the good we already have in our lives. I believe that the reason that there is no fire in the hearts is because there is no real encounter with Jesus happening. Jesus is present and available and desirous of the encounter. Always. But from what I've experienced in parishes, both in the US and here in Ecuador, the church just doesn't seem to be available to Jesus, and really doesn't make him present. Very few ever discover a Treasure of treasures in these sacraments or the preparation leading up to them. I write all that to share some of my view, but also to help explain what my mission is here. It's not to move kids along in catechesis programs, it's not to get people into the church or to go to Mass, or get to confession or pick up a devotion, or make some profession of faith, or change in some way, or anything like that. The mission is to be with Jesus, to live with him, that his life live and grow in me, and through all that to facilitate his encounter with others through me. It's to value the Treasure of treasures I have and share him with others. God takes care of everything else. The school year here in Chontal matches that of the coast, rather than that of the mountains, and that means that the year begins in May and ends in February. I arrived for the last week of classes and helped out in English for the week. I had the chance also to spend a few classes with the kindergarteners. They had a little activity where they were making picture frames out of foam paper. I realized that one of the little girls in the back wasn't making any progress, and all of the other kids were almost done. Dayana wasn't speaking much, and she seemed really lost, sort of separated and out of it. I got the sense that that was a common theme for her in school. So I asked the teacher if I could help her. Apparently, she can't cut with scissors, so I began cutting out all her shapes with her. Finally she put them all together, and had her little picture frame, well made, and the look on her face, she was so proud and happy. She belonged! I smiled, and said, "How about a hug?" Because she really didn't speak much, I thought she might be hesitant. But she lunged forward with a big, strong hug, and hung in there for a while. When I was hugging her, all I could think of was how precious she is to God - and I like to believe that that message transmitted somehow in the hug. It made my day. You can see Dayana in the back right corner holding her picture up high! And of course I got a few good photos of the parrot, who is the school mascot. She actually belongs to one of the teachers. The bird was brought to her because it was injured, it had been apparently shot out of the air, and now the parrot can't fly. She crawls around using her beak and claws. She's also shy with adults, but friendly with the kids. She'll whistle and say a few words, but the part I like best is that if you laugh, she'll imitate your laugh! Can you tell I get a kick out of the parrot!? We were also able to put together some funds to help rebuild the teachers' residence at the school. The teachers, except for one, all come from outside cities, usually Quito or Otavalo or Ibarra, which are all at least a 3 hour bus ride away. They come on Sunday and leave on Friday, staying the whole week. The school has some on-site rooms available, and others stay in a few available rooms in the pueblo. It really is a missionary life for the teachers, and they have very little funding or support, as schools like the one in remote Chontal are far from the centers of influence. In this case, the wooden support framing for the teachers' residence had rotted out because of termites, and the teachers were very uncomfortable sleeping there (and that's besides the rats running around above their shallow ceilings at night.) They are hoping to build a cement structure, and so we are helping with funding for the cement blocks. Fr Bill Lohan and I put together the funds, and the goal is to hand them over when the teachers come back later in April. I try to get away from everything, take a day off and find a place to be alone about once a week (sometimes it turns into two weeks). 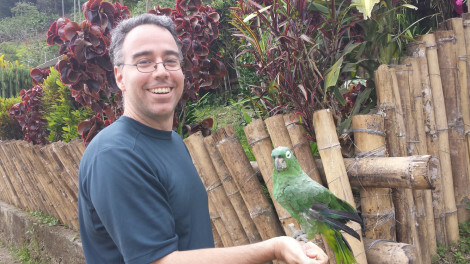 A nearby place called Mindo is a tourist place that has access to some ways to relax (although I usually write a lot while I'm there, like I am now!) There are a few friends there, including a religious community with a large spacious retreat area; a quiet hotel by a river that's $20 per night, and a friend Susan from the US who lives locally with her Ecuadorian husband and has done a lot lately in the church for the local community. Unfortunately, on the days I'm here, the local church is closed, but I've gotten to meet the pastor. 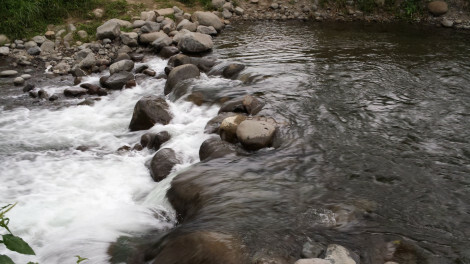 Mindo has a lot of adventure activities, like tubing, hiking to waterfalls, ziplining, and others. I usually am low-key trying to get some relaxation and get some walks in, as well as prayer and writing - as well as some different foods (there's pizza and burgers)! It's a change of pace. The place I usually stay is called Casa de Piedra, you can find it on Trip Advisor: http://www.tripadvisor.com/Hotel_Review-g609138-d4413537-Reviews-Casa_de_Piedra-Mindo_Pichincha_Province.html. It's $20 per night with free breakfast, and I've gotten to know the owner Henry and his family pretty well. They are good people. There is a beautiful river nearby, where you can swim. I try to take a dip each time, and in a way the swim in the clean waters of the river symbolically consecrates my time away from everything as a renewal of my baptism, a renewal of my relationship with Jesus. I am always hoping one day that something comes about in my ministry here where I can bring a group of people, maybe youth, from Chontal or Puerto Quito for a day of renewal, including the baptismal promises. Mindo is looked at by locals as a tourist place for gringos, usually out of their price range, so I like to find ways that the poor can have access to recreation, too. I'm also thinking that of including Mindo in a mission/tourism trip for inviting people from Boston to come to, we'll see where it goes. My friend Susan contacted me about meeting up about a month ago. She has written her own poetry book in both English and Spanish, and it includes not just her own poems, but also those of some local schoolkids. She uses some of the proceeds for church development. Well, we met up because she had read my own book and shared it with her family, and she said, "I think you need to translate it into Spanish." This was something that I started to do in the seminary with a Colombian friend who wanted to do the same thing - but we only got to one page! So, I said, "You know, it's a loooot of work. And some of the stories really don't have a cultural translation." We agreed to pray on it. But since then I've had the idea of selecting 20 of the reflections and doing something smaller. 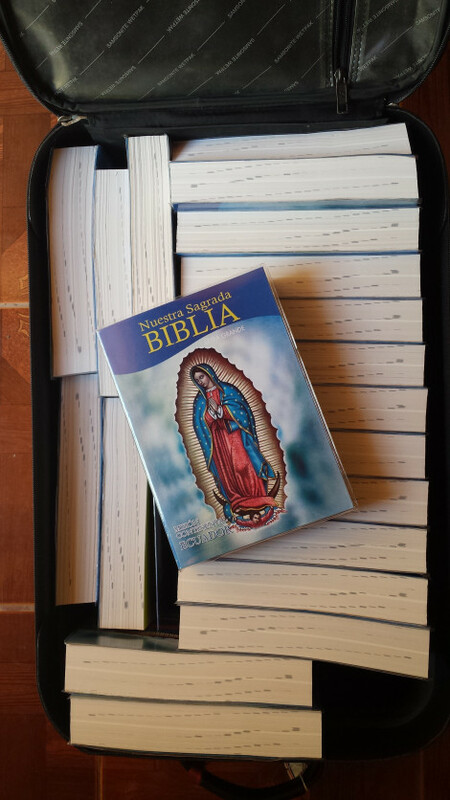 It keeps with the rosary theme (there were 150 reflections in English for the number of Psalms and original rosary beads, while there are also now 20 mysteries in the rosary), and I think it's manageable. We both like the idea, so we'll see where it goes …. I already mentioned one fundraiser for the family in Puerto Quito, but there was another fundraiser for the family of Scarlet. She's about a year old now, but was born with her right hip separated from its socket. The first doctor didn't do too good a job at the setting process, so surgery was ultimately required through a private doctor, and the costs were significant, more than the family could handle. They started a local fundraiser to help, and had recouped about $500 of the $2000 they were looking for. I had known about the fundraiser before I had left for Puerto Quito in January, so I told her mother Ines to talk to me if they couldn't get the funds they needed. At the time, I didn't know the amount of the fundraiser, so after I got back and heard that it was more than I thought (I was thinking maybe a few hundred dollars), I was kind of on the line to put up something. So, I thought I'd open it up to friends back home, and once again a generous friend offered to contribute and I offered to match. A relative also offered to contribute, and so we may have $1000 to give by the end of April. Scarlet gets out of her cast at the end of April as well. She's a quiet and friendly little kid, and when I see her with her legs spread wide in the cast, I always think of a sumo wrestler! Hopefully, she never gets that big! The renewal of my visa is in process and the visa should be ready any day now. I made the trip to the provincial seat (like the capitol city) of Ibarra in the province of Imbabura, to visit with the bishop. We had a cordial conversation and he gave approval on my visa renewal. The goal is to accompany the people of Chontal through this rain season and participate in the pastoral dimension of the church with the local priest. But it's also to establish intercultural bridges within the church between Boston and Ecuador, and also to visit other missionaries here while continuing to discern how God is calling me to follow as all this plays out. The bishop was open to all of that, so I felt that a door was opened to continue down that path, and that's what I'm doing! But I found that the letter I wrote to the bishop was a key to it all playing out. The local priest was going to put in a word for me, but I thought to myself, I'm going to write my own letter, introducing myself and explaining who I am, my history, what I'm hoping to do, what I'm asking of him. The priest took this letter with him and dropped it off with the bishop. As it turned out, the current bishop doesn't often give the green light on situations like mine. But after he read the letter, he told the priest to invite me to come and visit him. And then it all worked out. I'm sure that if I didn't write that letter, I would be back in Boston right now. It takes about 5 hours of bus travel to get from Chontal to Ibarra, and you pass through Otavalo. Otavalo is world famous for its indigenous culture and textiles - it includes South America's largest textile market. Well, I wanted to buy a charango, which is basically a small, indigenous guitar. (Small is good for a traveler!) I arrived at the market, found a vender, picked one out, and headed out. Unfortunately, when I made it back to the bus station, they told me there were no more buses until the next day. I went into management mode and thought, well, I can always get a hotel or hostel. But I thought, well, let's see if a friend can help out. So I tried to contact a few friends to get some advice on getting back or a place to stay, but no luck with any. So, I went to the bus driver, thinking, maybe he'll let me on. When I got to the bus, there were two other men in the same boat as me standing there. Plus, a cabbie was standing there, licking his chops. Finally the bus driver said something to us that I couldn't understand, and the two other guys invited me to join them in the cab. I couldn't understand everything that was being said, but it was clear that this was a way home. So what was happening was that the driver couldn't accept standing passengers at the station because the police are there. But, we could take a cab to the city limits, and he would pick us up there. So that's what we did. The bus driver picked us up about 15 minutes later at the city limits, and I got to stand for 3 of the four hours of the bus ride. If only I had the hat and knew how to play that charango ….. These days in Chontal, I am staying with the Nogales family. They own and live in what is basically a hotel, and one of their daughters lives there too, operating a clothing store out of the front area. On Palm Sunday, they invited me to go to Los Bancos, a town about a 2 hour drive away, for some time away to visit a church and go swimming. I said, are you going to repair the truck? Meaning, if so, I wouldn't be interested in going. Oh, no, there wouldn't be time for that. I said, well I need to be back for the Mass before 4. I was told, oh, we'll be back in plenty of time. Well, when we got to Los Bancos, they revealed to me that Ramiro, the father, was going to first drop the truck off for cosmetic work! And in the meantime, the rest of us were going to the local parish for confession and actually attend the Palm Sunday Mass, so that they, ahem!, would save the local priest the time when he arrives back in Chontal. I wasn't looking to do any of this! I'm thinking, my mission right now is to be in Chontal with the people, getting ready for the Palm Sunday services. Anyway, since Los Bancos is in the diocese of Santo Domingo where I was for a year and a half, I knew a number of the people there, including the priests and several of the active laypeople. Despite the fact that we got there before 9:30, the truck wasn't ready until 1pm! We never did make it to the swimming that they had told me we were going to. And although I drove the truck back at the end of the day as fast as I could (let me drive! ), we were late for the start of Palm Sunday! I had to take a shower because I was expecting to go swimming, and everyone else took off and started without me, and I ended up having no role in the Palm Sunday celebration. I was very upset, because being in the active ministry, my role is to be at the church preparing the services and whatnot. I don't think there was anything consciously intentional on their part in keeping me out of the services. I think it's just par for the course for them in the culture here, lacking a sense of responsibility and respect for others' interests. But it is still a lack of respect for me and, really, for the others in the Chontal community. 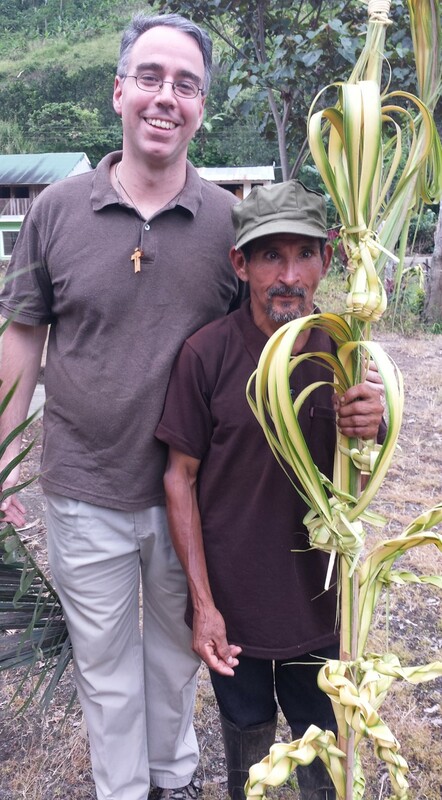 Ramiro is one of the principal lay church leaders in the community, and it became clear to me that he doesn't have a sense of pastoral responsibility for the church, and didn't understand that a missionary - and he himself! - ought to be participating in the organizing process of the Palm Sunday services! I felt I fell for the old bait and switch. I had been assuming that this man and his family would recognize a certain responsibility to me and the community in bringing me back in time to prepare for Palm Sunday. But I learned a bit more about who to trust and who not to…. Sadly, there are so many instances of leadership - both clerical and lay - that have an aversity to this, and it causes the greatest damage in the church, and in the world, in my opinion. (And I believe that if you've followed the outlooks of the popes of the last 50 years, they share the same viewpoint.) It is why Pope Francis' so explicit practice of ministry to the marginalized has such power in the world, the power of the Gospel itself. This type of real ministry opens the heart to an inclusive breadth of love and care for people, in a word, service. It creates true Christian leadership. Whereas, in this case my host family was really looking to *be served*. Without that serving heart in the church, you're left with the greatest poison that exists: hypocrisy. But there were a few redeeming moments from the day. I had heard from a friend about a great place in Los Bancos with a view, called the Mirador. While we were all still waiting for the car, I said, I'm going to the Mirador to check it out. Gradually the ladies of the family came too, while Ramiro waited for the car. We entered the main gate area where there were some cabanas for rent. Then, hidden away in the back we got to a nice restaurant (which is not common in that area), and when we went in, the owner was there. One look out the window revealed an amazing view of the mountains and river valley. "can we just take a look?" "Sure, no problem, you can even go outside, there's a pathway there." As we stepped outside, we encountered the most amazing views of the Rio Blanco (the White River) and its valley in the mountainside. If you notice, there was also a "mirador", a lookout deck built right around a tree, with a rickety footbridge to cross to reach it. It was awesome! What a breathtaking visit! We had found a hidden treasure! If there is a constant theme that I keep noticing over the years in my following Christ, it's this: that whoever listens to me and goes my way is in for some awesome surprising views! There are little baskets hanging off of different levels, too! There are kids all around the neighborhood, of all different ages here. They're always up for games, and one that's really popular is a game where we take turns imitating animals and guessing them. The next day after one of our games, I was at a neighbor's place and the daughter of 5 was talking and I was listening. Eventually, her imagination grew to the point that the area under the table in her house became her own hotel, with its own bathroom, kitchen, bedroom and door and window. I said, can I rent a room? She made an imaginary room and went and got imaginary sheets and pillow and blanket. OK, I said, how much? $50 she said. Which is about 20 times the going rate! So, I said, much to the delight of her mother, "You know how to take advantage of the gringos!" A little while later, that price had dropped to "5 or 10 dollars." And by the time she had brought in her own blanket and pillow, the price had dropped to "10 cents" with a smile … As I left that night, I realized again the power of listening to those who often have no say. Kids, elderly, whoever it might be that is often overlooked and underheard, spending time being present and listening opens up a power in people to exercise their personality, to live and grow. It's one of the greatest gifts you give someone. I visited Scarlet's family one day early in the week, to catch up and plan a bit for holy week. Scarlet's mother Ines is the president of the church. Her daughter Samantha had some clay that they had brought down from the mountain recently, and we started to make things out of it. We made a little person out of the clay with head and body and arms and legs and feet (Gen 2:7). And then, we said, "It's not good that the man should be alone." (Gen 2:18) So we made a woman also out of clay next to him. In the process of mixing the clay in water, Ines noticed that there was a tiny speck of gold in it. So we started sifting through more clay and found a bunch of other specks. "We're rich!" Samantha started saying with a big smile. Of course we knew it wasn't much, but it was amazing to find this speck of gold with so much value in the midst of the clay that we used to form the man and the woman. It's like that with God and us. He forms us out of clay, but within that clay is gold, too. Sometimes we have to look for it in each other, but we are rich because we have each other. And God is rich, because He has us …. The local government is beginning to provide some social services for the elderly in the county here, and one of the young women in the pueblo, Veronica, works for them. A group of seniors has been meeting once a month over the past year for social activities, and this month they met on Holy Thursday and I was invited. It was good to get to know and meet the seniors from a variety of the nearby pueblos, and be able to serve them food. A popular dish in the mountains during holy week is called fanesca, which is made with milk, fish, fried bananas or plaintains, yucca, and some other ingredients. Because the two principal lay leaders of the church were mostly occupied with their own businesses and not available during holy week, the work of organizing was left mainly to me and to Ines. We did a lot of visiting houses and inviting people and listening and planning. There were a number of people that normally don't participate much that I was able to invite in. For example, one woman who lives on the other side of the river comes each week to the Bible presentations. In one presentation where we talked about listening to God's voice, she confessed to everyone how when she was a child she won a singing contest, and how she loves to sing. But even though others in the villages know and admit she has a great voice, in the Mass the lay leaders dominate the singing, and she really can't participate. So, I invited her and the usual music leader to meet together with me - we met and worked together and they decided on all the music that we would do for holy week, and that they would sit together, etc. It was a great meeting. But in the midst of all the holy week planning, the lay leaders would often look to come in at the last moments and insist on changes to things that had already been planned or set up. Now, the lay leaders - in fact most leaders - are not accustomed to hearing "no", but I fed them a healthy dose of the word "no". If we are always fed either just "yes" or "no" from others, it's like eating an unbalanced diet: we get sick, spiritually. We need to be fed both "yes" and "no" from others in a spirit of respectful collaboration in order to have a healthy spirit. Most people will only feed those in positions of authority a "no" passively: they just don't respond or show up, they avoid. But I fed them with the actual word. We all need this balance in our lives, and it takes courage to use "yes" and "no" in a spirit of love and the good that's available to everyone. We also have to keep in mind that if we don't say "no" or oppose the person who is on a control streak, we are really saying "no" to all the people who suffer because of it. They remain buried in the land of non-participation, and this is unhealthy. The greatest conflict usually happens in the tension between getting exterior results and interior results. There will be some who will step on others (usually without noticing it) in order that a decoration be made more beautiful, the right song be sung, this has to be this way or that way. For them, the relationships that are forged in the whole process of the organizing the event are not the end: the aesthetics and correctness of the event itself are the priority. For them, people and our relationships with each other are ultimately at the service of the event. This is a typical business approach, that is even often applied in the church. On the other hand, Christ sees the event itself to be at the service of each of us and our relationships with each other. The end result of the Holy Week and Easter services is how they've grown our relationships with each other. There is greater beauty in the participation of everyone in the singing, than there is in the beauty of the song itself. We are more important than the things we create or do. And so the result that the Christian is called to aim for is always the communion of relationships amongst each other, and each of the events in our path is a graced opportunity to grow and transform this communion. "The man of the world does not wait for things to happen, but anticipates them and forces them into his service. The man of God waits for the hour of Divine Providence, responds to the impulses of grace, devotes himself to the entire will of God, for the present and the future, and he does so with a filial self-surrender that leaves the whole care and glory of everything to God his Father." from In The Light of the Monstrance. In the middle of holy week, on Tuesday in the evening, the whole village lost power. Susana is the only one in the village with a gas generator and so she and her restaurant have power all the time. That night, there was a big soccer game between Ecuador and Argentina. About 15 people piled into her small restaurant to watch TV, it was packed. The whole village was pitch black, but this one restaurant was packed with fans. I remember thinking how the bugs in my room start showing up at night when my light is on. Bugs can't help but be attracted to light because it's literally built into them. Night bugs evolved or were created to navigate by moonlight at night. So, wherever artificial light overwhelms the moonlight, a bug will get stuck in, as they say in the airlines industry, a holding pattern. They keep circling around the light. But it's the same with us. We can't help watching a TV, a computer screen, smartphone screen if one is nearby. Because there is something built into us that is attracted to the light. We are all attracted to Jesus crucified. Because we all are attracted to the light. Earlier in the week, Ines and I had gone around visiting homes looking for people who wanted to sponsor a station in the procession of the stations of the cross. We found volunteers for all the characters as well, from Jesus to Mary to the crying women, to Nicodemus and John, and Simon. On Good Friday morning we all processed around the pueblo to each station, where family members in each home read prayers and reflections from a guide. The sun was so hot! But many participated, and it was a good experience. At the end of the last station, I looked up, and the two "thieves", the two teens, were hightailing it with their crosses at a swift jogging pace, running away and ahead of everyone, ready to get the whole thing over with. I doubt they'll ever say "yes" again to invitations to participate in the church, they'll probably only do the bare necessity for a while, whatever they "have" to do. But when we think that religion - particularly Christianity - is about putting heavy crosses on people instead of relieving their burdens, then that is why the youth run away from church. Amidst all the activities, there was the Mass of the Last Supper on Thursday, on Friday was the procession of the stations of the Cross, plus the preaching on the seven last words of Christ, plus after that, the reading of the Passion, the adoration of the Cross, and Holy Communion. On Saturday, it was the Easter Vigil, and on Sunday the Mass of the resurrection in the afternoon. It was a full, full three days, and I think it was an overload for the church here. Like the kids running away because of their heavy crosses, most people are reluctant to participate, only if they sense obligation and duty. As the one deciding the details of what the events contained, everywhere I could, I tried to prune and move things along and lighten the load. One of those instances was my preaching. 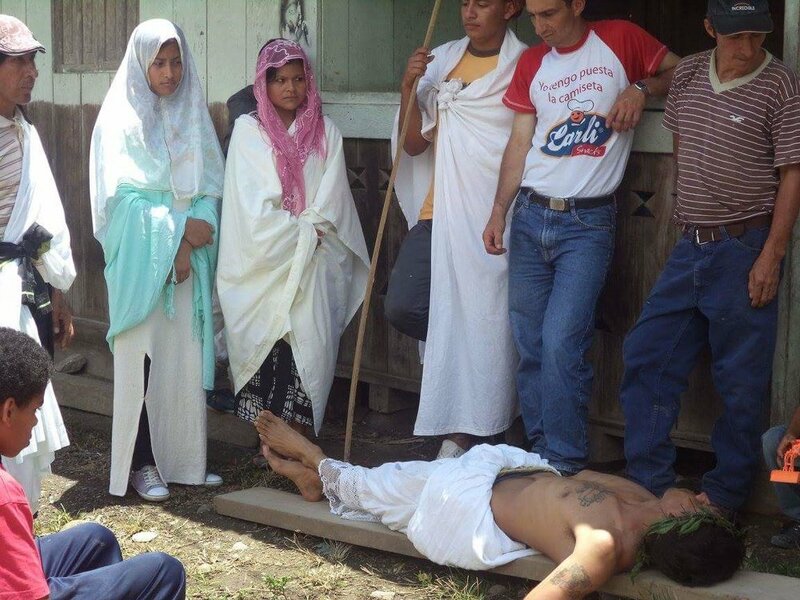 The "tradition" is to preach on the seven last words of Christ on Good Friday. That means basically seven homilies all strung together at once. Think about it. Most people can only digest *one* basic point per day, maybe even per week. Here, we've got *7* homilies all at once. (And that's just at this one service!) It usually goes for an hour and a half. But I was preaching for the first time here, and I made each one short. We finished in a half an hour, and all the points were tied together. I think that the people that want the burdens for themselves instead of Christ's grace probably didn't enjoy it so much. But I believe that those that want some of the abundance of Christ's love from the cross certainly did. On the night of Good Friday, one of the neighbors had a great idea: showing movies for everyone. One person in the village now has a video projector, and they went to a neighbor's driveway to set up a big set of white sheets to project. They played two movies, one on the life of Jesus, the other was Mel Gibson's The Passion of the Christ (played later for the adults). I stayed for both! I cry like a baby at the Passion movie, I always do, but I try not to be noticed, and especially at night it's hard to see. Every time I watch the movie, Jesus speaks to me through some new aspect. But what was great about these movies were that they could engage everyone in the community in a very inviting way. And I wanted to be present to show my support to the guys who were doing it (one of which is not a "regular churchgoer"). Everything came to a head on the Easter Vigil and the Sunday Mass of the Resurrection. It will be a grace to see which new movements of ministry and life start to unfold this week and beyond in the season of the Resurrection. Until the next monthly update, have a blessed Easter season!